I think it’s safe to say that there’s no longer a soul on the high seas who cares about the Pirates of the Caribbean series anymore. Sure the first one was a huge hit with both critics and audiences, but although the first two sequels made serious bank at the box office, they were plagued by problems that some critics felt ruined the experience altogether. By the time the fourth one came around, it proved to be so unmemorable and bland that even the biggest fans of the series seem to have forgotten what actually happened in that one, and for a while it seemed that the franchise was temporarily dead in the water. But Disney and producer Jerry Bruckheimer saw fit to kick the series into a whole new direction with a fifth entry, subtitled Salazar’s Revenge (aka Dead Men Tell No Tales in the States), which early reaction suggested was a major return to form after the flawed previous entries. So, is it? 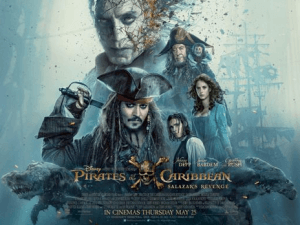 Erm, not really – if you thought On Stranger Tides was the most in-one-ear-and-out-the-other film in this series, then wait until you see this one. By “major return to form”, it’s probable they meant that this film takes quite a few plot elements of the first one and clumsily rehashes them into something more manufactured and nowhere near as fresh. Like that one, it features villainous undead pirates, this one being led by Javier Bardem as the titular Salazar, who seeks revenge on all pirates after he and his crew are trapped in something called the Devil’s Triangle (I would ask what that is exactly, but if this series has taught me anything it’s not to ask questions, dammit), but on one pirate in particular – can you guess who that is? Why yes, it’s Captain Jack Sparrow, played once more by Johnny Depp, who must now team up with a young good-looking man (Brenton Thwaites) and a headstrong young woman (Kaya Scodelario) and head out to the seven seas to try and find a way to break the villain’s curse – and if any of that should sound familiar to you, then the plot of this film is almost an exact carbon copy of the first film, only without the charm and freshness that made it a hit to begin with. I heard someone describe this film as a greatest hits compilation of the series, and there is some truth to that; Salazar’s Revenge takes all these elements from the previous films, from the basic plot of the first film to the wild and somewhat creative imagery from some of the sequels, and just plays them out on screen without really doing anything with them. The feeling of “been there, done that” is one you’ll be having throughout the entire film, as none of it is sticking with you because you’ve seen all of this before in previous entries, and because of that the film is quite a dull slog to sit through, even though at 129 minutes it’s the shortest film in the series to date. Instead of being invested in these characters and being interested in the rehashed storyline, you’re constantly reminded of how much more entertaining and – dare I say it – fun the first couple of entries were at the very least, especially when the elements of those films this one does are nowhere near as enthralling. Thwaites has zero charisma as a semi-leading man, making even Orlando Bloom’s similarly bland Will Turner look three-dimensional by comparison (Bloom, incidentally, bookends the film with a couple of appearances as his character, designed only as fan-service to loyal fans and not much else), while Kaya Scodelario can’t help but feel like a pale imitation of Keira Knightley, no matter how hard she tries to differentiate herself. The effects are not even close to being as good as they have previously been, and because a lot of the action and set-pieces are heavily CG there is no awe factor to any of them because they look unbelievably fake and never like they’re actually there. As for Depp, it legitimately feels like he’s sleepwalking through this one, more so than any other performance he’s given as arguably his most popular character. The film’s production was dogged by certain alleged difficulties with its lead star, and that kind of shows in his lazy rendition of the character which might as well have the words “contractual obligation” tattooed all over his forehead, as even he seems to be utterly done with the series and this character by this point. Geoffrey Rush, who also returns as Captain Barbossa, is at least trying to act like he gives a crap, which is more than can be said about Depp at this point, not quite to Bruce Willis levels but certainly to about the same extent that Wesley Snipes couldn’t care less while he was in Blade: Trinity. I guess if you’re still eager to find out what Captain Jack Sparrow is up to nowadays, you’ll probably get what you’re paying to see, although be prepared to have nothing new added to the proceedings and just being treated to a lazy mish-mash of the series’ past endeavours that feel tired and dull instead of being fresh and exciting. Chances are you’ll probably even forget about it as quickly as you did On Stranger Tides, and maybe if this film underperforms like it is with critics right now, then maybe it’s time for this series to drift out to sea and stay there. Pirates of the Caribbean: Salazar’s Revenge is a disappointingly dull retread of the series’ previous highlights that are done nowhere near as excitingly nor as fresh, and not even Johnny Depp seems to care anymore about this franchise even as he’s flailing around as Captain Jack Sparrow like he’s sleepwalking or, in keeping with the spirit of his character, drunk off his arse the entire time he’s in this shipwreck of a film.